Port Angeles was once called ‘The Center of it all on the Olympic Peninsula.’ While the small coastal city doesn’t officially use that motto anymore; the ‘center of it all’ idea remains the same. Port Angeles is home to incredible scenery, awesome food, and some of the friendliest people we’ve met in Washington. Located about two and a half hours from Seattle, Port Angeles is a fun, year-round getaway from the Emerald City. NOTE: The drive to and from Port Angeles (which includes a ferry ride) is entertaining in its own right. Tove and I made pit stops in Bainbridge Island, Poulsbo, and Sequim (we suggest a visit to Olympic Game Farm if you stop there). You can also easily visit Port Townsend, if you want to. The top attraction in Port Angeles is Olympic National Park. It’s easily one of the most diverse national parks in the country; featuring coastline, a mountain range, temperate rain forests, hot springs, and much more. Olympic National Park spans the entire Olympic Peninsula (it’s nearly 923,000 acres), so Port Angeles only gives you access to certain parts of the park. We really wanted to visit Hurricane Ridge (described as the “most easily accessed mountain area in Olympic National Park” — located just 17 miles from Port Angeles), but there’s limited access to the area in the winter. The road to Hurricane Ridge is only open (weather permitting) from 9am-dusk Friday-Sunday. Winter activities on Hurricane Ridge include: snowshoeing, cross-country and downhill skiing, snowboarding and tubing. We also hear there’s a spectacular view up there. Unfortunately, we didn’t get to enjoy Hurricane Ridge because the road was closed due to heavy snow. Tove and I still wanted to enjoy Olympic National Park on our Port Angeles getaway, so we stopped by the Olympic National Park Visitor Center (3002 Mt. Angeles Rd.) when we first arrived in town. 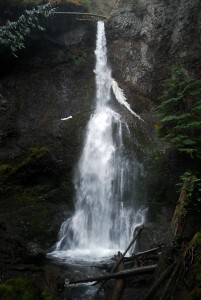 With several areas closed in the winter (including the hot springs), the worker there suggested a drive to Lake Crescent and Marymere Falls. 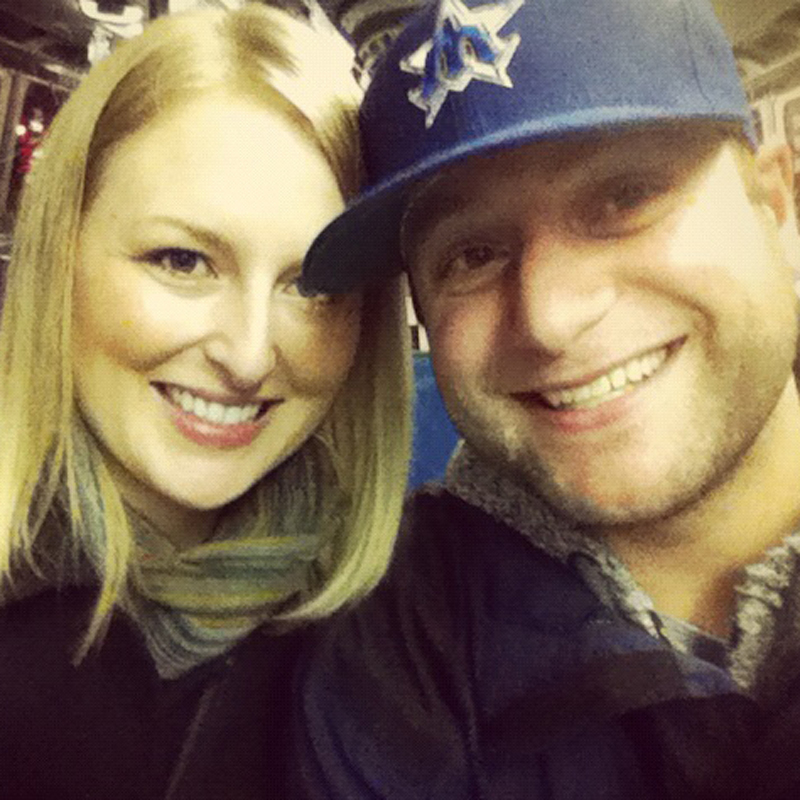 Tove and I didn’t hesitate, we hopped in the car and cruised 20 miles outside of Port Angeles for an adventure. Lake Crescent looked spectacular, but the beauty was limited by low clouds and rain when we were there. You can find access to Marymere Falls Trail at Storm King Ranger Station. It’s a 1.5 mile hike through a moss-covered old-growth forest that ends at the 90-foot Marymere Falls. The hike is mostly flat, but you do have to climb some stairs to view the waterfall. It was a fun hike, and a good way to enjoy the park in the winter when everything else was closed. 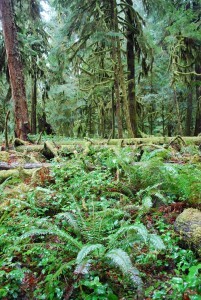 Since we were so limited by the weather, Tove and I really want to visit Olympic National Park again in the summer. Port Angeles has much more to offer than the national park. Located along the Strait of Juan de Fuca, the city has plenty of waterfront trails and beaches. To help you understand what’s in the water around you in Port Angeles, we suggest visiting the Feiro Marine Life Center (315 N. Lincoln Street). With three touch tanks, you can get up-close and personal with starfish, sea cucumbers, sea urchins, shrimp, hermit crabs, fish, and much more. 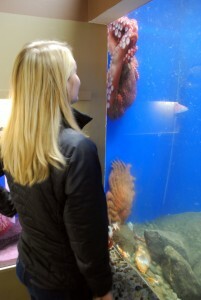 While the touch tanks are awesome, the top draw at Feiro Marine Life Center is the giant Pacific octopus. 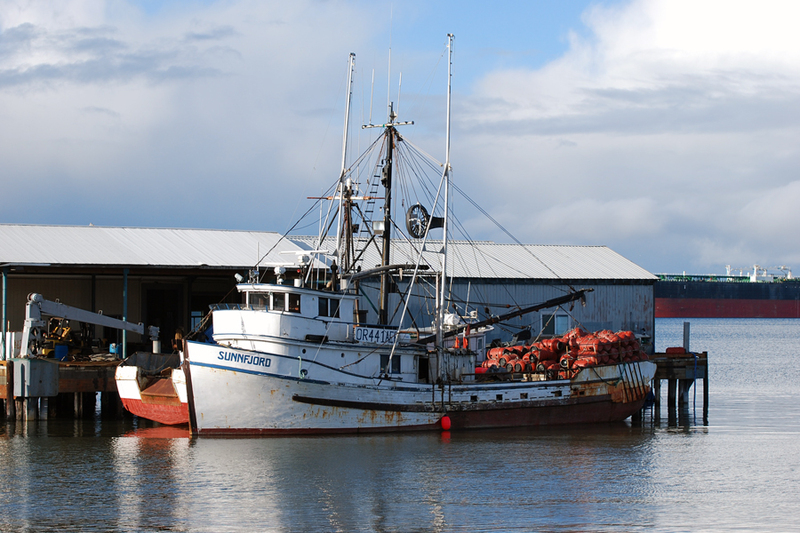 There’s also a great opportunity to enjoy wild sea life in and around Port Angeles Harbor. Keep your eyes peeled for sea otters and harbor seals. You can also go whale watching in the area in the late spring and summer. First, there’s Colonel Hudson’s Famous Kitchen (536 Marine Dr.). 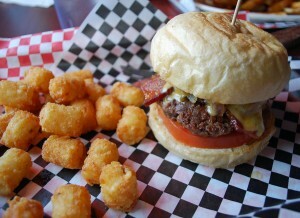 A lot of places boast gourmet burgers (and they’re kind of a dud), but this place truly makes AWESOME burgers. 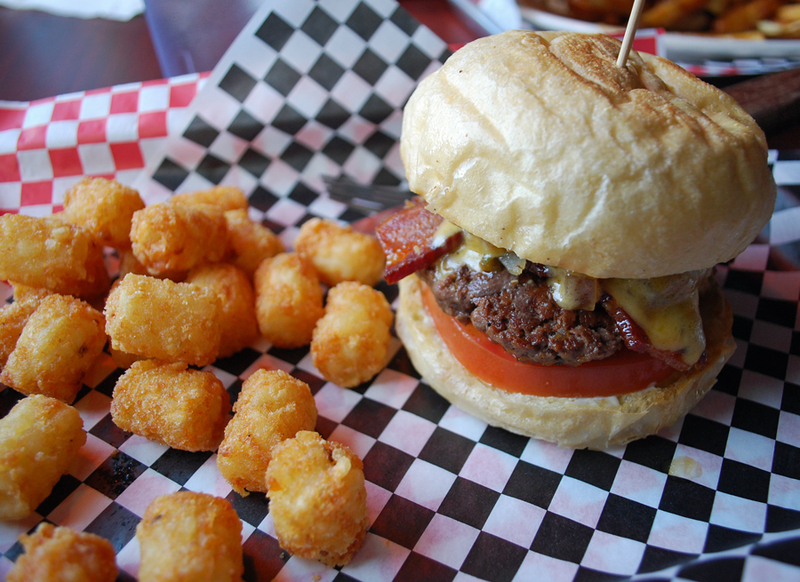 It’s honestly one of the best burgers — they’re called Hudburbers instead of hamburgers — I’ve had lately. The coolest part is — Colonel Hudson’s Famous Kitchen makes their ingredients from scratch. Tove and I ordered poutine, the spicy hud, and a teriyaki burger. To make this place even cooler, they have a game room in the back with bubble hockey, old-school skee ball machines, and more. The other restaurant we checked out in Port Angeles was the Next Door Gastropub (113 W. 1st St.). This was easily the busiest restaurant in town. While most of the city was shut down on a Monday night, this place was packed. 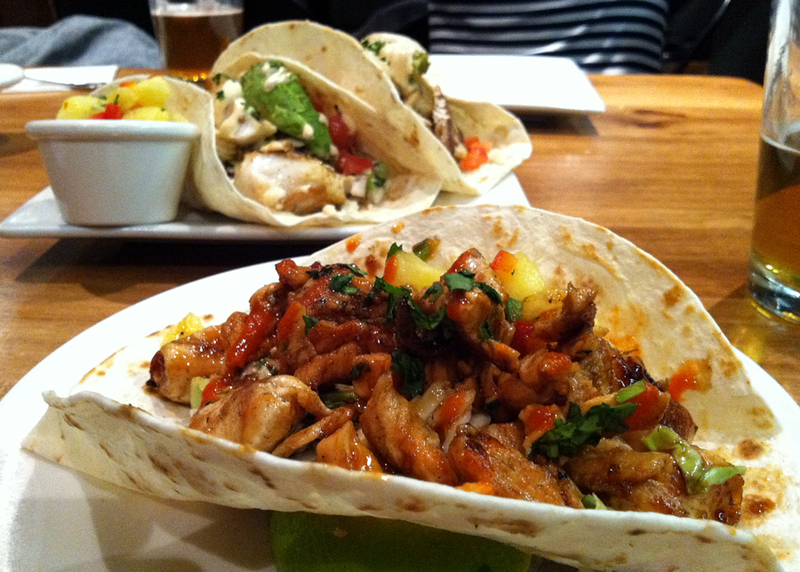 There’s good reason — they serve tasty food and good beer in a fun atmosphere. Tove and I ordered salt n’ peppa chicken wings, poppettes (a glorified jalapeno popper), Morroccan chickpeas, blackened cod tacos, and a tiger chicken taco (which was our favorite). There’s one other thing that really stood out about Port Angeles — the locals are extremely nice. From the workers at the Olympic National Park Visitor Center, to the clerk at the Port Angeles Inn (where we stayed when on our trip), everyone welcomed us with a friendly conversation. The weather was cold when we were there, but we could really feel the warmth of the community. We wouldn’t hesitate to visit again thanks to the fine folks of Port Angeles. Have you ever visited Port Angeles? What are your favorite things to do there, best places eat, etc.? We’d love to hear from you! Please leave a comment below or connect with us on Twitter, Facebook, and Google+. Don’t forget to also check out Seattle Bloggers for more great places to check out around the Emerald City!